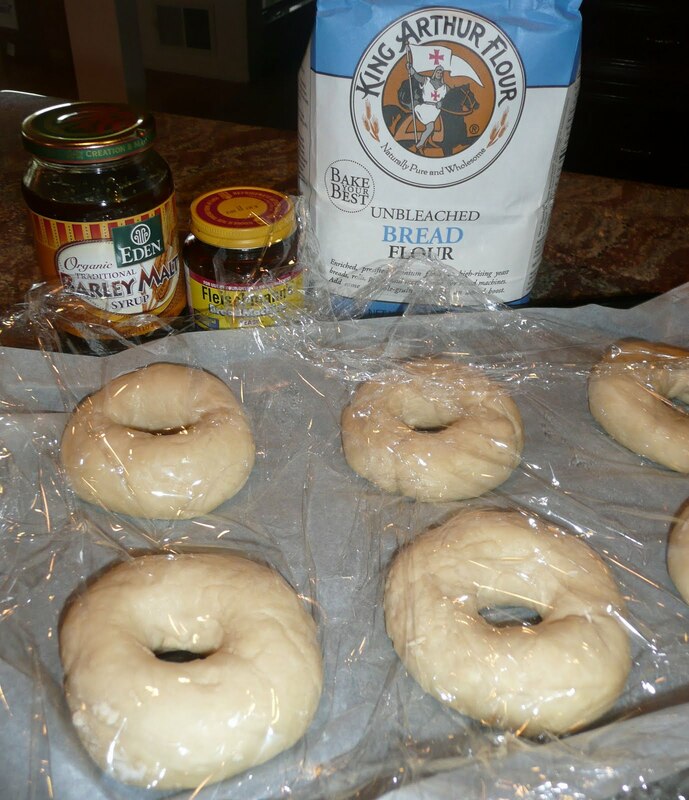 There are a couple of ways to approach making homemade bagels. The first is to be determined to make great, nay legendary, bagels better than one can get locally (unless locally is near a renown bagel making bakery), using techniques perfected by bagel makers of yore (specifically Bagel Makers Union 338). The other way is just get a bunch of friends together to enjoy the process, bake some bagels and enjoy a nice brunch. The recipe for bagels that turned out to make a good pretzel (seriously, we were dipping the baked rings into salt and mustard) offered us ease, a quick rise (40 minutes), a dunk in boiling water and a 20 minute bake. I had the dough ready to go when our friends arrived ready to roll (or poke) the bagel dough in shape. The payoff was dense, hard bagels. The other recipe I made the night before including shaping the bagels. They were kept in the fridge overnight and then boiled and baked the next morning. This is the batch we were in ecstasy about. Basically I didn’t find making these bagels that complicated. You just had to follow the steps. Here are some tips based on my bagel making experience. Prepare to hand knead unless you have a truly heavy duty mixer. Bagel dough is stiff. It wants you to beat it up, so don’t feel guilty about pushing it around. Prepare to knead for at least 10 minutes. Think of it as working off the calories just eating one of these beauties is going to cost you. Since this dough is so stiff, be aware that if you are contemplating multiplying the recipe you’ll need forearms like Popeye and hands like a masseuse to knead more than one batch concurrently. Recognize you are not a professional baker – you will make mistakes, but they will be delicious. I used oiled parchment paper to line the first batch’s baking trays (which some recipes recommended). I should have used cornmeal. My golden brown, perfectly round bagels stuck like an s.o.b. (son of a bagel) to that paper. What could we do? We left them on their parchment paper until the guests had arrived and could ooh and ahh over their supposed perfection. Then Gary sliced them off with a bread knife. Be patient. The dough takes time to come together and absorb all that flour. It takes time to knead, shape and rise again. Boiling and baking really didn’t take that long, but you should wait until the hot bagels have cooled a bit so you can properly taste them (not to mention avoid burning hands and or tongue). Be skimpy with your toppings. Sprinkle perhaps a tablespoon or two of sesame seeds, poppy seeds or kosher salt over the top of your bagels. Too much will overpower the bagels. Respect the heritage of the plain bagel and the limitations of the home kitchen and do not attempt an asiago-cranberry-garlic-everything bagel. This is an abomination as per my official bagel religion. If you are an unbeliever, add your chocolate chips, but be prepared when you meet your bagel maker to answer for such transgressions. What I would do different? I think I would play around with the boiling time (make it a bit longer) and maybe add some malt syrup to the boiling water to see if I could get a smoother, shinier crust with a tad more toothiness. (Some add an egg glaze before baking the bagels to replicate this crust, but I resisted that technique for purist reasons.) I would have used cornmeal on the baking tray (maybe with the parchment) so that the bagels wouldn’t have glued themselves to the paper and have had to be surgically removed. I don’t like to repost other bloggers' recipes without permission and to be honest my Really Good Bagels recipe is not that different than the one posted by The Fresh Loaf blog and forum (the author who in turn adapted it from the book The Bread Baker’s Apprentice.) Thanks to Floyd Mann, the genius behind The Fresh Loaf, for his permission to reprint his recipe. The recipe is included at the bottom of this post, or you can click here to see it instead. The water should be lukewarm (hot tap water). I used the malt syrup. This is easy to find at Whole Foods and other natural foods groceries. I cut into pieces slightly smaller than Fresh Loaf did – about 4.25 ounces, resulting in 13 bagels (a baker’s dozen) and 1 mini. Using a scale really helped for this process. If you don’t have one, just try to get your dough pieces as even as possible. After rolling each dough piece into a ball and letting rest for 20 minutes I used the ball and poke method Fresh Loaf did, which is basically poking your thumb through the center of each roll and then, keeping your thumb in the middle, turning the dough to smooth and even out the dough ring. Make your hole about an inch or more in diameter to resist the forces of an overnight rising and subsequent baking and remain a hole. ﻿I added the baking soda to the water and boiled the bagels about 1 1/2-2 minutes on each side. I baked them for about 10 minutes total at 500 degrees (I did not adjust the heat down as Fresh Loaf does). 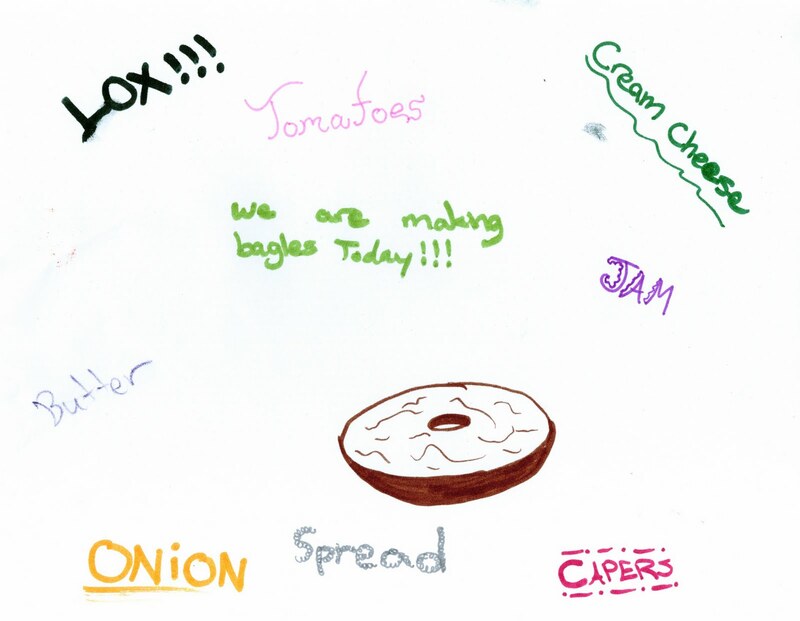 Below is The Fresh Loaf's bagel recipe, reprinted with permission. Adapted by The Fresh Loaf website from the book The Bread Baker’s Apprentice. I have made a few edits for clarity since the recipe had comments written in the first person, but this is The Fresh Loaf recipe without any changes in ingredients or directions. Stir the yeast into the flour in a large mixing bowl. Add the water and stir until all ingredients are blended. Cover with plastic wrap and allow to rise for two hours. Remove the plastic wrap and stir the additional yeast into the sponge. Add 3 cups of the flour, the malt powder (the one unusual ingredient, which Mann was able to find at the local health food store), and the salt into the bowl and mix until all of the ingredients form a ball. You need to work in the additional 3/4 cups of flour to stiffen the dough, either while still mixing in the bowl or while kneading. The dough should be stiffer and drier than normal bread dough, but moist enough that all of the ingredients are well blended. Pour the dough out of the bowl onto a clean surface and knead for 10 minutes. Immediately after kneading, split the dough into a dozen small pieces around 4 1/2 ounces each. Roll each piece into a ball and set it aside. When you have all 12 pieces made, cover them with a damp towel and let them rest for 20 minutes. Shaping the bagel is a snap: punch your thumb through the center of each roll and then rotate the dough, working it so that the bagel is as even in width as possible. Place the shaped bagels on an oiled sheet pan, with an inch or so of space between one another (use two pans, if you need to). If you have parchment paper, line the sheet pan with parchment and spray it lightly with oil before placing the bagels on the pan. Cover the pan with plastic and allow the dough to rise for about 20 minutes. Place the pan into the refrigerator for the night. Preheat the oven to 500 degrees. Bring a large pot of water to a boil. Add baking soda to the pot to alkalize the water. 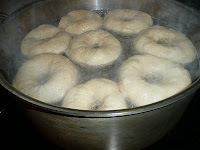 When the pot is boiling, drop a few of the bagels into the pot one at a time and let them boil for 1 minute. Use a large, slotted spoon or spatula to gently flip them over and boil them on the other side. Before removing them from the pot, sprinkle corn meal onto the sheet pan. Remove them one at a time, set them back onto the sheet pan, and top them right away, while they are still slightly moist. Repeat this process until all of the bagels have been boiled and topped. Once they have, place the sheet pan into the preheated oven and bake for 10 minutes. After 5 minutes rotate the pan. bake until the bagels begin to brown. Remove the pan from the oven and let cool for as long as you can without succumbing to temptation. I love bagels and can buy OK (not great) bagels. So I guess I haven't been motivated to make my own. But it looks like fun - and I really like your idea of having a bagel party. I'll have to give that a try. And I didn't even know you had another blog (somehow I missed that). Headed over to check that out now . . . The only thing about doing a bagel making party is that the best ones need to rise overnight - you could get together to boil, top and bake them, though! 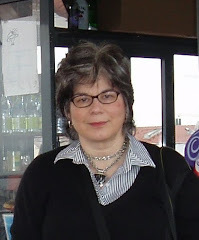 I have several other blogs, but this is the main one. I don't really promote them, they are more laboratories if you will. I love this post. 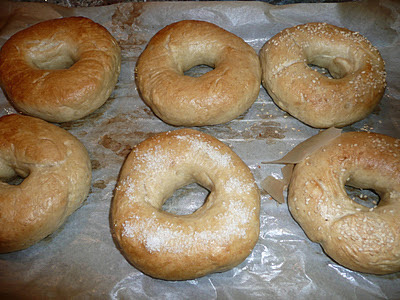 The joy of homemade bagels is both the process and the product. The recipe I use is very similar to your two day version. I use a sourdough starter which is activated the night before, so it's a three day process. But most of the time I am not doing anything. I agree with your caution about using anything other than a very heavy duty mixer. This dough is tough. But if your mixer stops working, let is cool off and it might start up again. Otherwise, arms like Popeye will help! !